First of all, I am not sure where “the university” is located, but if it is receiving state funding someone may need to open an investigation immediately. Secondly, I am fairly certain that it is unnecessary for attractive college girls to launch a personal website just to get a random stranger to sleep with them. In today’s society “implied consent” has effectively replaced “domain presence” as the character trait of choice. Under the Canadian pharmaceuticals category I was given a plethora of choices. Once reputable apothecary website, (partsatcost.com) is having a sale on generic Viagra ($1.85 per dose) and professional Viagra ($3.85 per dose). Another online pharmacy assured me that their “herbal enlargement supplements” could be trusted because they have been featured on Fox News and are shipped in discreet packaging. While I would have no reason to question the quality of prescription medication originating at a site called partsatcost.com, I was somewhat shocked to learn that there is a “professional” grade of Viagra. It is still unclear whether requiring an industrial strength erectile dysfunction drug would be flattering or embarrassing. Are talking about the difference between Tylenol and Extra Strength Tylenol or this is more of a differentiation between being a casual hobbyist or being licensed and bonded in Delaware? I do like the insinuation of trustworthiness because they have been “featured on Fox News.” Of course, they do not specify whether the graphic above their product said “Medical Miracle” or “Pennsylvania Man Forced to Quit His Job as School Crossing Guard.” There was even one e-mail reminding me that medical marijuana can be used to treat “a wide variety of ailments.” Indeed. The final category featured Rolex watches at “blowout sale prices.” I too can accessorize my body with all the trappings of financial wealth without paying through the nose for a timepiece. My first clue that the vendor might not be completely on the up & up was the absence of vowels from the e-mail address (czbq@mmyd.net). If it is not a news organization, an all consonants domain name could spell trouble. Conveniently, they accept all major credit cards. I have to wonder about the people who voluntarily give their credit card number to websites they discover through a spam filter just to seem like they can afford a designer wristwatch. There is a glorious irony in making one terrible financial decision in order to fool people into thinking you have made a series of sound ones. 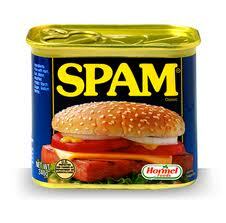 Have you ever wondered why it's called SPAM? I know it stands for spiced ham but as for why it has been used to refer to junk emails I have no idea. I wish my dentists knoxville can shed light to that because they get those all the time in their mailbox as well.